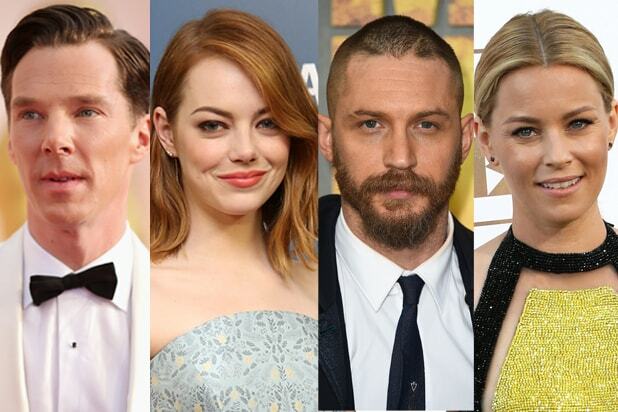 Academy Award nominees Benedict Cumberbatch, Emma Stone, Felicity Jones, and Rosamund Pike and Oscar winners Eddie Redmayne and J.K. Simmons are among the 322 people invited to join the Academy of Motion Picture Arts and Sciences, the Academy announced on Friday. The 322 invitations are the most ever given out since the Academy began announcing the names of its invitees more than a decade ago. Other actors invited to join include Elizabeth Banks, Martin Freeman, Heather Graham, Tom Hardy, Kevin Hart, David Oyelowo, Dev Patel, Chris Pine, Daniel Radcliffe and Jason Segel. The Academy’s Board of Governors made the selections on Tuesday night after reviewing list of recommended new members drawn up by committees from the 17 AMPAS branches. Among those invited to join by other branches are Netflix’s Ted Sarandos (Executives Branch), composer/musician Trent Reznor (Music Branch) and writers Graham Moore, Dan Gilroy and Rick Famuyiwa. The Directors Branch, as has been its habit in recent years, devoted more than half its 26 invitations to foreign-born directors, including Morten Tyldum, Bong Joon-ho, Francois Ozon and the five directors whose films were nominated for Best Foreign Language Film at the last Oscars: Pawel Pawlikowski (“Ida”), Abderrahmane Sissako (“Timbuktu”), Damian Szifron (“Wild Tales”), Zaza Urushadze (“Tangerines”) and Andrey Zvyagintsev (“Leviathan”). Pawlikowski, Sissako, Szifron and Zvyagintsev were also invited to join the Writers Branch of the Academy, as were writer-directors Damien Chazelle (“Whiplash”) and Malcolm D. Lee (“The Best Man”). Those who receive invitations from more than one branch must choose a single branch to join, though they can vote in other categories if they have been nominated in those categories. In the past, restrictions were placed on the number of new members, with the idea of keeping the voting membership of the Academy under 6,000. But the Board of Governors eliminated the restrictions in 2013 in order to open up Academy membership, and the number of invitations increased from around 175 each year to around 275. This is the first year the number has topped 300. Last year, 6,124 Academy members were eligible to vote – and even after you subtract the members who have died or gone to non-voting status, this year’s total should add a couple hundred voters to the rolls. The Academy has been slowly increasing the number of its female, minority and foreign-born members in recent years, battling criticism that the 7,000-member organization is too old, too male and too white. But according to members, appeals from AMPAS executives to the branches to admit more female and minority members have lessened under the current Academy president, Cheryl Boone Isaacs, after reaching a peak under her predecessor, Hawk Koch. Before 2010, women typically made up between 20 and 25 percent of the people invited to join the Academy. The number jumped to almost 30 percent in 2011 and 2012 and topped 30 percent in 2013, before dropping to 25 percent last year and again this year. While this year’s roster could well include more women, minorities and foreign-born film professionals than ever before, that’s largely because it also includes more people, period. Applications for membership must be submitted by March, with each candidate sponsored by at least two current members of the branch to which he or she is applying. Each branch sets its own requirements for membership, ranging from a certain number of screen credits to a number of years of continuous work in the field. An Oscar nomination or win grants automatic eligibility but does not guarantee an invitation.